With a 12+ year career under their belt and a continually growing fan base, the history of Jedi Mind Tricks has never been officially documented -- until now. 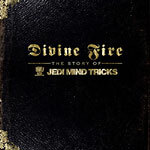 Divine Fire: The Story Of Jedi Mind Tricks, the first ever DVD release by the renowned independent hip-hop powerhouse, is an insightful excursion into the roots of an underground empire. Join Stoupe The Enemy of Mankind and MC Vinnie Paz as they journey from inauspicious beginnings to underground stardom. Also including over 1 hour of bonus material/footage, the veil has finally been pierced, revealing one of the most unique and illustrious stories to have never been told. Plus there's a bonus disc with 5 tracks looking back over the years, hand picked by Vinnie Paz.